Leanne Shirtliffe is an award-winning humor blogger. She writes funny stuff for the Huffington Post, Nickelodeon’s NickMom.com, and the Calgary Herald. When she’s not stopping her twins from licking frozen flagpoles, she teaches English to teenagers who are slightly less hormonal than she is. She lives with her husband, their kids, and dust bunnies in Calgary, Alberta. Don't Lick the Minivan: And Other Things I Never Thought I’d Say to My Kids by Leanne Shirtliffe is a terrific book for moms! I love the part in this book where she found her kids carving their names in the minivan with rocks because my daughter did the exact same thing to my car. There's so many similarities in Don't Lick the Minivan by Leanne Shirtliffe to my life as a mother and I'm sure to most moms. I love books that help us mothers realize our family is normal and that most parents have the same struggles we have. This book helps me let go and focus on being a good mom and not worrying about all the little things. It has also helped me look back on moments and laugh. The parenting tips throughout the book are a hoot. What and awesome book! 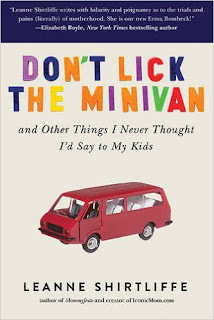 You can find Don't Lick the Minivan by Leanne Shirtliffe on Amazon, Barnes and Noble and other bookstores.